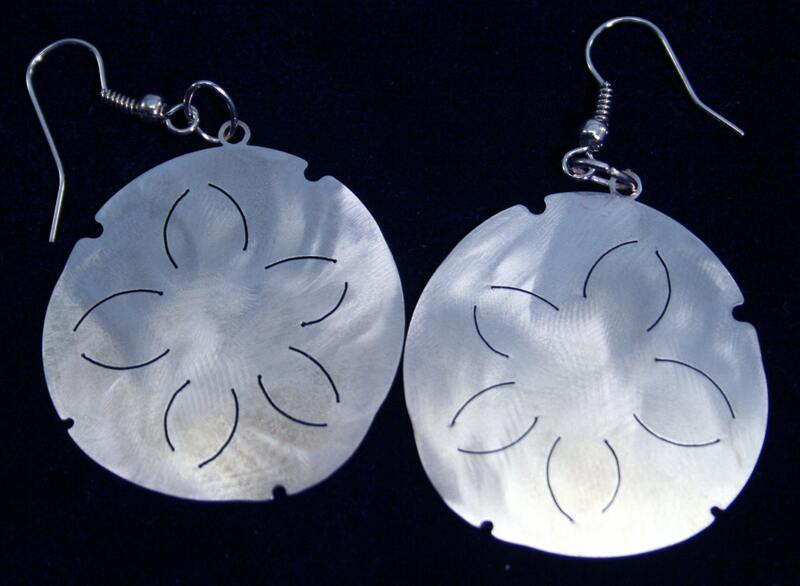 Whimsical Little Sand Dollar earrings. 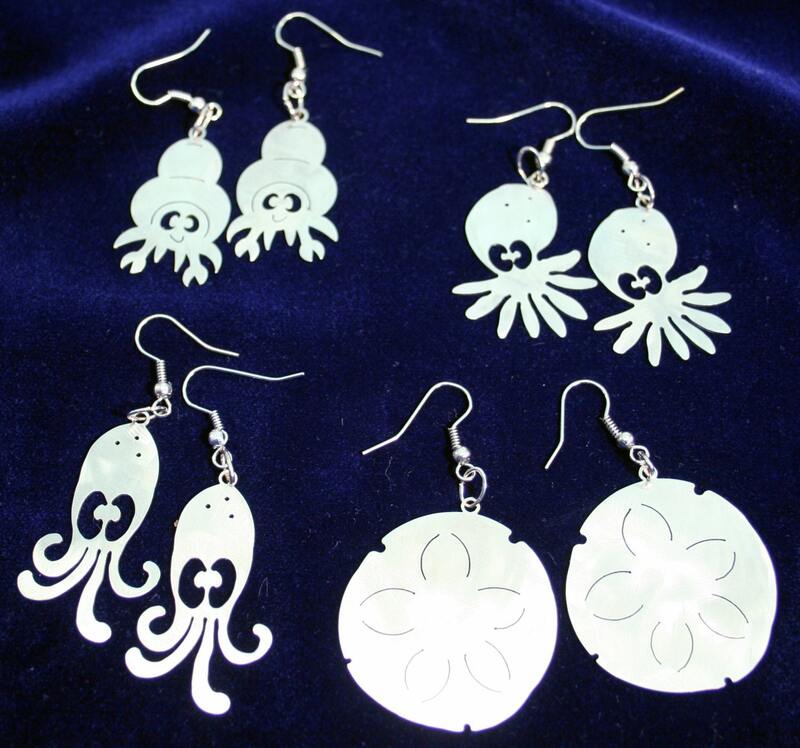 The truly amazing and beautiful mother of my children designed these quirky little sea creature earrings. Made from 24 gauge stainless steel, tumbled to remove burs and then finished with a shiny brushed surface.The earrings measure approximately 1-1/4" wide by 1-1/4" tall, not including hook and 6mm jump ring and dangly earring hooks, overall length is approximately 2". Check out all the Sea Creature tide pool friends - more coming soon - as well as key chain versions. Paypal is my preferred payment method - Now accepting credit cards directly through ETSY. Payment in full is due prior to shipping. Orders cancelled prior to shipping will be honored but charged the $0.20 listing fee / restock. I accept Etsy Direct Payment, PayPal, credit cards, and Bitcoin, Ethereum and Litecoin. If paying with Digital Currency, please use ‘Other’ as your payment method when checking out, and write that you’d like to pay with Bitcoin in the “Note to Seller” field. Once the order has been placed, I’ll contact you with an invoice containing a Bitcoin amount and an address you can send payment to. All ready made items will be delivered to my local post office within 3-5 business days of payment and shipped via [domestic deliveries only (USA)] USPS Priority mail and typically arrive in approximately 2-3 business days after departing my local post office. (Holidays may add 1-2 days) Custom engraved (ready made items) will ship typically within 10 to 12 days of payment once the item is engraved. Custom made may take up to two weeks for design, proof approval and production prior to shipping. Large orders and rush delivery can be shipped UPS, FedEx, Priority or Express Mail with prior arrangements and additional fee. If provided with contact info a confirmation of shipping will be sent. Insurance can be added to any item at buyers request for an additional fee. All orders over $50 in value will automatically have insurance costs added to shipping. Items to be shipped outside of the US must contain all info required on US Customs Form PS 2976 Customs CN-22 - contact me to research shipping to your specific destination before placing an order if it is not one of the countries shown. Shipping costs subject to change due to postage, materials and handling. • UK and CANADIAN CUSTOMERS: You may be charged a customs fee. UK approximately £12 on items valued over £15. In addition Royal Mail may charge £8 as a handling fee. Please keep this in mind before placing your order. Thank you. • Buyers are responsible for all customs, tariffs, fees, taxes, etc. If you are ordering for a Holiday, anniversary, birthday or other event it is recommended that you purchase the shipping upgrade to priority mail to insure prompt arrival for inspection to insure it is the right item, arrives un-damaged and meets any deadline you may have. priority mail also gives a tracking number which fist class does not. All items returned undamaged within 30 days will be refunded the item price less the $0.20 listing fee and a 10% (of item purchase price) re-stocking fee to cover cost of shipping materials. Repair or replacement of broken or damaged pieces available within 90 days at no charge if item is returned along with a self addressed prepaid postage envelope similar to original shipping package, for return delivery. Most design ideas are created by myself or gathered from from various ideas of friends and family then modified to fit the medium chosen. Do You have an idea? A custom charm? Let me know I do requests all the time. Please provide a phone number if your order destination is outside the US. Some items may be redesigned from the images shown due to materials, design integrity, structural flaws etc without notice, I do try to keep my images as up to date as possible.